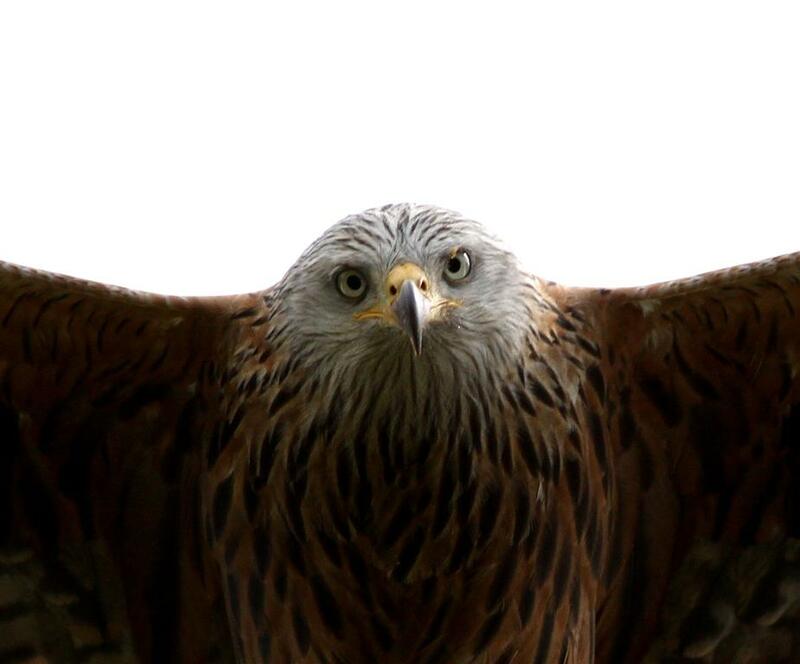 I decided on Friday morning to give my usual haunts a miss and go further afield for a change so I headed to the Chilterns to have a go and getting some decent shots of one of my favourite birds the Red Kite. 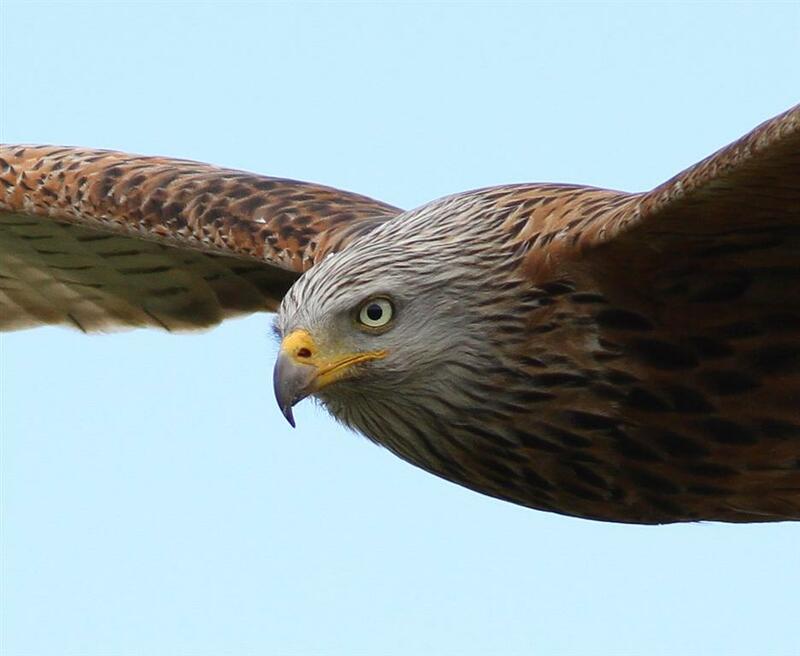 There are a few decent places to see the Kites in the Chilterns but I headed to my favourite spot Watlington Common which is not far from J6 on the M40.Here, unlike Grigrin Farm in Wales, the birds are not fed and have not got wing tags which I much prefer.I arrived at 10.15AM to find an empty car park and straight away had two incidents. Firstly as I got out the car I realised I'd forgotten to put my boots on and was still in my house shoes which were not much better than slippers.What a burk!!!! specially as earlier in the week I'd forgotten to put the battery in the camera.I'm going downhill fast. Secondly two cars arrived in quick succession.From the first emerged a large Dobberman who immediately homed in on me and whilst it hesitated over which part of me to eat 2 Alsatians leapt out the back of the second car.It was like walking round a zoo with the cages open.Luckily all the dogs were soon grabbed by their owners and leads securely attached. A quick walk through the woods and you are onto the common and what a cracking place it is with spectacular views over the countryside.There are lots of small woods and scrubland there to see birds other than the Kites but you really go there for the Kites.I usually walk around the common but all you need to do is to plonk yourself down and wait for them to float by sometimes only a few feet above your head.Some shots below click on them to enlarge. When I left for home I had to drive through the small town of Watlington because of the one way system.It was a little jammed in the High street and whilst waiting for the traffic to move I noticed a Red Kite slowly drifting down the road at low level.The locals took no notice at all because they are used to them.What a difference a few miles make!!!! I've processed some more recent pics and set them out below.They are of the Spotted Flycatcher again I'm afraid mainly because I have not been able to find anything else decent locally. The last pic is a repeat of one I posted some time ago but now it has been confirmed as a Blue-headed Wagtail when at the time I wasn't sure if it was. This morning I thought I'd have a look around locally before the rain forecast arrived this afternoon. Here are a few shots I took.Nothing new or special I'm afraid except for the drake Garganey.I was lucky to be nearby when I received a text saying one was on the railway pool at Marsh lane and as I don't see these chaps very often I shot over there and managed a few shots. Another morning in the Warwickshire countryside. Popped out again this morning to the spot I went to yesterday but this time I checked that the battery was in the camera!!!!! The pair of Spotted Flycatchers showed again but were very flighty and only appeared now and then.Got a few more shots. A couple of Common Buzzards showed up and for a short while were fairly low for a change.Great site when the sun is on them. Tried for shots of the Swallows and the House Martins that were zooming around.Got loads of sky shots as usual.Also a Thrush was looking around for food and landed near me before rapidly scooting off. Local Birding Burk strikes again. When I failed to see one at Cannock Chase a birder told me a place where Spotted Flycatchers could be seen every year.Oh yeah I thought but this lunchtime not wishing to go far I decided to give it a go and drove the few miles to this unlikely spot.I parked up and within 10 seconds of getting out of the car I saw a Spotted Flycatcher 15 metres away on a nearby wall. Wow!!!!! Raised the camera and switched it on and got precisely nothing.Switched it on and off again and got nothing.It was dead.Right I'll take the battery out always a good move.The trouble was there was no battery.It was at home being recharged.What a burk!!!!!!!! I changed into boy racer mode ( a mode I'd not used for many years) and went home for the battery.It took me half and hour there and back so not much damage done or so I thought because after an hour I couldn't find my little friend anywhere. So a tale of tragedy? No luckily for me because patience paid and the Spotted Flycatcher showed briefly a couple of times and I managed some shots.Another lesson learnt but how many lessons are there? Went to Marsh Lane on Sunday morning arriving at 7.30AM in glorious weather. What a picture the place was but the sighting of a Wood Sandpiper and an Osprey early yesterday morning by others was not to be repeated. A walk round with some of the regulars found nothing new but the chat was entertaining including a discussion on the various merits of a couple of bulls with the cows in a field opposite the car park hide. There was a bit of excitement as we crossed the causeway when we spotted 4 Common Buzzards over the cottages which prompted me to say "We need a Red Kite".Only seconds later Steve spotted a Red Kite high over our heads.Some wishes come true then. I was pleased because this was a Marsh Lane tick for me bringing my total there to 266!!!!! Oh No that's wrong that's the number or birds I've ID incorrectly.My Marsh Lane total is 136.Sorry about that. Some pics below.The Kite was very high up heading slowly East so pics not too grand but pleased to get a Marsh Lane Red Kite. Trapped indoors most of Friday waiting for a furniture delivery (do these guys ever arrive when they are supposed to?) I only had a bit of the afternoon available to get some shots so I went the short journey to the NT place at Baddesly Clinton to walk the grounds. Three years ago I found two nesting Spotted Flycatchers there but absolutely zilch since so I was not expecting much but found a pair of Grey Wagtails near the church in a large puddle just the other side of the boundary fence.I managed to get pretty close but the light was straight in front of me so a bit tricky getting decent shots.They were either too dark or blown out.These are some I could salvage. A Trip to Upton Warren Flashes. I decided early on Thursday morning for a change to my usual haunts so I went over to the flashes at Upton Warren hoping to get some shots of the Avocets and see if they had had any chicks. As I walked along the path to the main hide enjoying the morning sun I was accosted by a man with a wheelbarrow who blocked my path.When he growled out "Are you a member?" I very quickly produced my Warwickshire card and I was allowed to pass.Good to see that visitors to this site are checked out. It was good to see at least 6 Avocets and 3 chicks from the hide.The adults were very aggressive if anything came near the chicks and soon chased them off. Getting decent shots was another matter not only were they a fair way off but the bright sun was in the wrong place.I'm sure I would have done better if I'd gone in the afternoon.Nice to see them though.I'd only seen them on the coast before. On Monday morning I dashed over to Brandon Marsh as the weather was warm and sunny for a change. I struggled all morning for something to point the camera at all the birds were keeping a low profile so I had to entertain myself with trying to get some flight shots of the very flighty Cuckoo. The only other bird of interest was I could point the camera at was my first Kingfisher of the year mind you it was so far away that it might have been at another reserve.The days are long gone when you could walk into the Carlton hide and have at least one KF posing for pics. 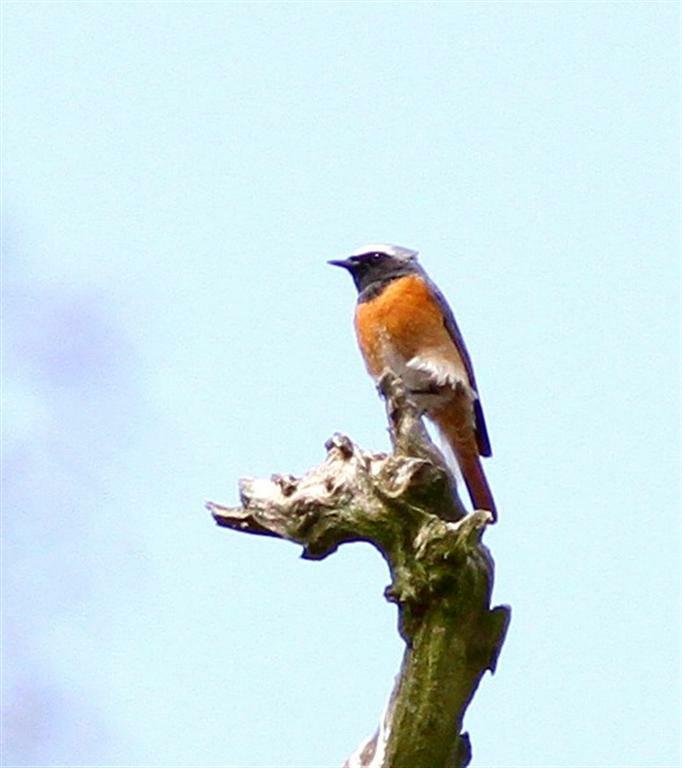 On Tuesday morning I went on my first trip of the year to Cannock Chase.Parked at the Seven Springs CP at 10.00AM and did my usual walk to the Stepping Stones with my main target to get some Redstart shots. I arrived at the Stepping Stones not having taken one shot.I had seen quite a few birds but they were a long way off and things didn't improve here either because,although I found 3 Redstarts,the swine all sang from the top of trees that were nearly as tall as the Eifel Tower.Perhaps I was too early to see them lower down??? Did better on the return journey to the CP when I saw a couple of Tree Pipits but I couldn't get close enough for a decent shot. Best of all,not far from the CP,I heard and tracked down a Wood Warbler.I was very chuffed as I'd only seen one before in the Wyre forest.There was a problem though the chap I had found was in a coppice that was so gloomy that I'm pretty sure it was the woodland were the Blair Witch Project was filmed so pics not too good.